Travel insurance provider, Protect Your Bubble, give advice on how to stay safe on the slopes this season. Many people live for the winter and wintertime sports, and now is time to hit the slopes and enjoy the powder. For new skiers or snowboarders, Protect Your Bubble, travel insurance provider, has a list of tips to help you be safe on the slopes. 1. Take a lesson – If strapping skis on is a totally new experience, a lesson is important. Learn the basics: how to maneuver slopes, keep balance and slow down to prevent falling or even worse falling and getting badly hurt. 2. Take it slowly – Speed demons find themselves in the hospital when skiing. Speed leads to loss of control and loss of control leads to a hospital trip. Keep a safe speed for your personal ability level. 3. Don’t mix alcohol and skiing – While tempting, alcohol and skiing do not mix. Higher altitudes change the body’s reaction to alcohol, and alcohol affects control, reflexes and alertness – three things you need on a slope. Save the cocktails and pints for the evening après ski. 4. Rest – Skiing and snowboarding can be extremely tiring and put pressure on the body it is not used to. Get mental and physical rest each day. Studies say the most likely time to get hurt skiing is about 3p.m. on the third day. Muscle fatigue sets in at this point. Also, stretch before and after each round of skiing. It will help your muscles recover. 5. Set your bindings – With eight times a higher possibility of injury, incorrect skis and bindings can be dangerous. If DIN (the control for how easily the bindings snap open) is set too high for the person weight and ability, be sure to share that information with the emergency room physicians. When hiring skis, it’s a good idea to take note of body weight in kilograms before setting off on holiday and be frank about skiing ability. After all, even a professional was once a new skier. If planning a ski trip, consider travel and vacation insurance. 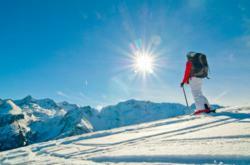 Protect Your Bubble’s winter sport insurance programmes are tailored for a skiing holiday. Visit Protect your bubble for more details. Backed by a Fortune 500 company, Protect your bubble is a specialist gadget insurer that offering a wide range of gadget insurance products as well as travel insurance, car hire excess insurance, smartphone insurance and more, all at great value prices.